We understand that you have a busy schedule, and appreciate spending some time with us. We, at Acrosser Technology, would like to sincerely thank you for visiting our booth at the recent APTA Expo in Atlanta, Georgia last October 9-11, 2017. We understand that you have a busy schedule, and appreciate spending some time with us. 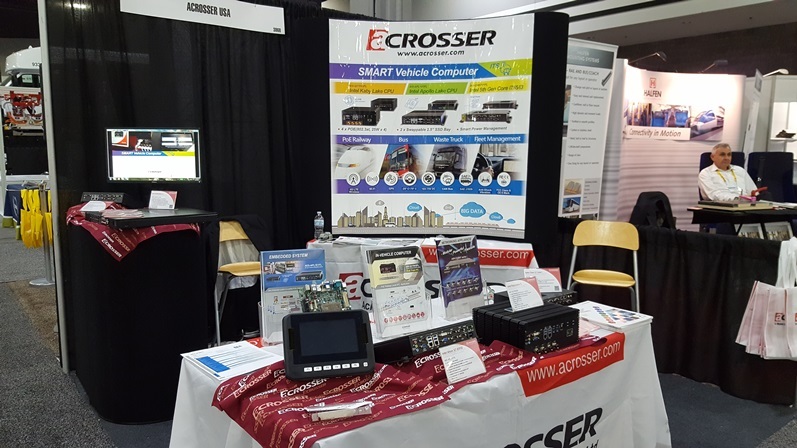 Just like all the other APTA exhibitors, we certainly hope that you were able to get a good look at acrosser’s current and future models of embedded computer systems for various vehicles and transportation applications. Please contact us immediately should you have any questions and/or clarifications, at telephone (714) 903-1760 or by email at sales@Acrosserusa.com. We thank you again, and truly hope that we had met or exceeded your overall expectations, and we look forward to working with your organization in the near future. Sponsored by the American Public Transportation Association (APTA), the APTA EXPO is the world’s largest trade show for the Public Transportation Industry. APTA is the leading force in advancing public transportation and its Annual Meeting runs concurrently with the EXPO. This year, APTA EXPO will be held on October 9 to 11 in Atlanta, Georgia. acrosser Technology is pleased to inform you that we will attend this event to demonstrate our latest Embedded Computer products and creations for this industry. During this event, we will showcase Acrosser’s latest railway –level in-vehicle PC, the AIV-Q170V2FL. This particular model is equipped with the latest Intel Skylake-S Core i7-6700 TE CPU and features 4 ports of 25W GbE LAN PoE with M12 connectors, 4 swappable 2.5” SSD, 8 USB 3.0 ports and 4 Mini PCI-e for 4G/GPS modules with 4 SIM card sockets, all working together in offering good quality wireless data transmission ability on the train. Besides the AIV-Q170V2FL, we will also show you our latest products and solutions for Telematics and the IoT environment. These are: the AIV-APL1V1FL, our upcoming Intel Apollo Lake value system, and our tried and tested AIV-QM97V1FL using Intel 5th generation Broadwell Core i processors. Some common but valuable applications for these versatile rugged PC devices include: as Media Server/ Entertainment Server on the Railway or Tour Bus, Fleet Management for Waste Trucks or Government Fleet Vehicles, etc.